Okay, let must just say now that I know making copious purchases now slightly goes against my "summer mantra" that involves shopping less and doing more. But you know what? Reading is doing! And on that note, I've actually been tearing through books this summer. I just crushed (fellow Seattleite and New York Times reporter) Stephanie Clifford's excellent debut novel, Everybody Rise, over my trip to Idaho. Is it ironic that I read a book about making it in New York when I was taking a vacation from trying to make it in New York? Perhaps. Set in the monied, glamorous world of pre-recession 2006 Manhattan, the book follows the ambitious and (sometimes painfully) relatable rise and fall of smart and charming social climber Evelyn Beegan. Her ambitions to infiltrate New York's highest social strata are at first driven by her job building up an elite social network online, but she's quickly absorbed by the parties, vacation homes and tempestuous relationships she navigates with old money socialites, bankers and their pearl-clutching families. As many reviewers have put it, think of Everybody Rise as Edith Wharton in the modern era. I found it every bit as juicy as Gossip Girl's early seasons, but with a heavy dose of realism and a heroine with whom you can actually identify. As an NYC transplant, it's easy to put myself in the shoes of Evelyn and imagine that I might do and think a lot like she does as she deals with demanding numbers-driven startup bosses, Regina George-like women you love and hate at the same time and personal trauma you'd rather forget than face. However, this is a witty, fast-paced and entertaining story to which anyone who's ever been an outsider can relate. It's a deliciously colorful peek into a Manhattan I can only imagine, and the kind of book you pick up and kind of want to tear through over one long, lazy day under your AC. Speaking of AC—I've been on a major design kick in my room as of late, and recently snagged a couple of really inexpensive indulgences to make my little room a bit more chic: a brass reading lamp (from Target!) for my bedside table and yet another Henri Matisse print (this one will hang above the head of my bed). And to wear whilst cozied on my blue-and-white bed digesting all the drama of Everybody Rise? 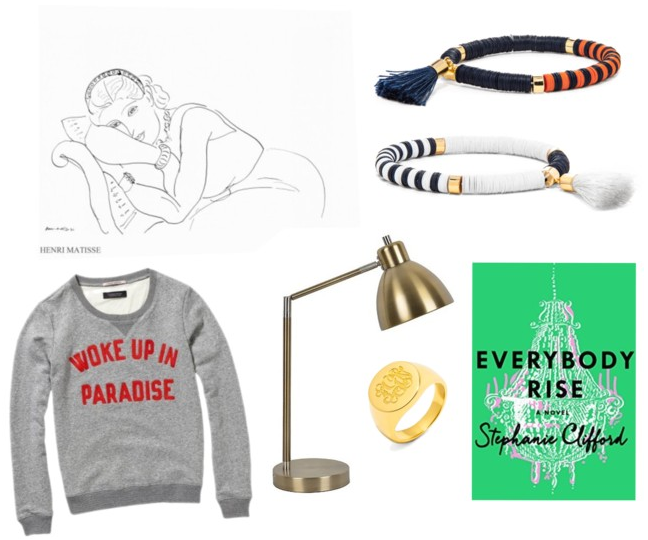 This cool and kind of appropriately themed "Woke Up In Paradise" sweatshirt from Maison Scotch and one of the essential-yet-subtle accessories of the upper crust: a monogrammed signet ring. WANT TO WIN A COPY OF EVERYBODY RISE AND A $50 GIFT CARD TO BAUBLEBAR? Simply leave a comment below answering this question: What were you doing in 2006? A winner will be selected at random on Thursday August 27, 2015. This giveaway is open to US addresses only. Prizing and samples provided by St. Martin’s Press. DISCLOSURE: This post is sponsored by St Martin's Press, and I received compensation for hosting this giveaway. Thank you for supporting the content that keeps SHUT UP I LOVE THAT running! Freshman in college .... crazy times! As a fellow Manhattan transplant (and at one point Seattleite, too!) I definitely need to read this book! I haven't found a fun woman in the city book since Bergdorf Blondes. In 2006 I was a junior in high school, doing my thang! I graduated from college in 2006. I can't believe it's been 9 years--I've lived in three apartments and had 4 jobs (all at the same company) since my days at Villanova. In 2006 I was in morocco, riding a camel, eating delicious food with my hands (turned out to be a bad idea), and going to Arabic baths.. Since then I have moved more times than I can count, finished undergrad and medical school and moved to the Midwest for residency. I feel for the main character and her transplanting to a new city! in 2006 I was graduating from high school, falling in love with my first boyfriend, going off to Virginia Tech & finding some of the best friends i've met! I was starting fresh at a new school after transferring colleges to major in English. It was an awkward transitional time, but ended up being the best decision I ever made. In 2006 I was starting my senior year of high school- planning for college and soaking up all the awkwardness that comes with being a teenager! In 2006, I was working in Chicago, but I did take a fantastic trip to Japan for a friend's wedding! So glad we went! In 2006, I was having my first baby and trying to figure out all that entails. I was getting out of an abusive relationship and going back to school! In 2006 I was ending my Junior yr in high school/ beginning my Senior yr. Had no idea one yr from then attending college at the UofA would change my life in the best way possible! I was graduating high school in 2006! Hard to believe I was just starting high school in 2006, completely unsure where I would end up. And now i'm in San Francisco navigating a whole new city. This book sounds so great! two years out from college, living in boston! it was great. I was graduating from college and working at a great little preschool. Was reading Gossip Girls in between SAT tutoring! Learning to play golf before starting high school in NC! I took a summer classes at USC, which solidified my decision to go to film school! In 2006 I was a junior in high school, studying way too much and stressing over college. Seems like ages ago but man I wish I could go back. I miss true summer vacations! In 2006 I was in my second year of college. I had just moved away from home after spending my first year at the community college in my hometown. it was a good year! I learned a lot and had a lot of fun! Changing careers after 30 years and freaking out about my future! It all turned out okay thank goodness. I was in college... studying a lot but having fun! In 2006 I was a junior/senior in college. It was so easy to get a job interview back then- little did I know that around the corner was 2008- when siddenly everyone would be unemployed! 2006 was the start of high school for me! Got braces and was a part of the marching band...nuff said.